If you're looking for the newest mobile gear with Intel's brand-spanking new fourth-generation processor included, Sony is bringing its stuff to the table. They have a few new mobile options that update their line of VAIO products with the VAIO Pro and VAIO Duo. Sony is bringing its TV know-how to the VAIO line with its Triluminous color rendering and X-Reality display engine technologies. Both models offer Rapid Wake feature to bring the systems back up to speed quickly after sleeping. And their USB ports can charge a device when the notebooks are in sleep mode or even powered down. There AC adapter has a USB charging port, too. These notebooks will connect to any NFC enabled device by simply tapping it to the VAIO to share data and connecting via Bluetooth. Sony will offer SKUs with various Haswell processors, up to the Core i7. The VAIO Pro will be available as a 1.92-pound model with an 11-inch display, or a 2.34-pound model with a 13-inch touchscreen. The VAIO Pro 13 will offer a high-speed PCIe SSD drive, which Sony claims is the first of its kind. Connect the optional sheet battery to double the battery life of either, endowing the VAIO Pro 11 with 14 usable hours and the VAIO Pro with . The VAIO Pro models will be available in Carbon Black and Carbon Silver on June 9. The VAIO Pro 11 is expected to fetch $1149, while the VAIO Pro 13 will go for $1249. The VAIO Duo 13 combines the best features of a notebook with the convenience of a tablet.. The 2.93-pound computer expands its touch screen size from the original VAIO Duo 11 by minimizing the bezel. Sliding the screen up from tablet mode reveals a full-sized backlit keyboard and a trackpad. The Duo 13 continues to work even when put into a sleep state. It updates applications and receives mail with minimal power consumption. 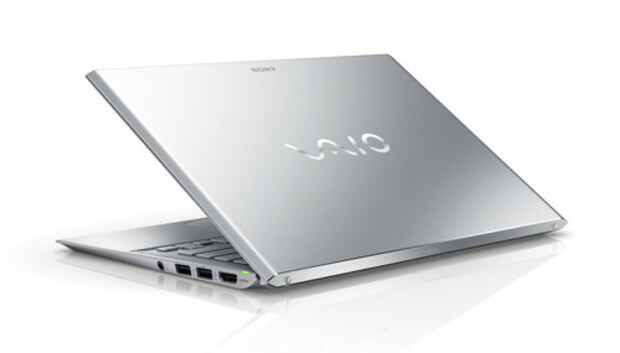 The VAIO Duo 13 will be available June 9 in Carbon Black and Carbon White and will cost $1399.